I’ve been addressing Envelopes with Hyegraph Calligraphy for my clients this season for Napa Weddings, Birthday Parties & other festive events. My clients love Hyegraph Calligraphy and their parties are all over the globe. We have a client who had a Downton Abbey themed wedding in Boston, one of my clients flew to Chicago for her wedding and another to Italy. It’s fun to hear about my clients’ events and their activities. I love serving San Francisco area hotels and other venues with their business cards and brochures. Whether it’s a Napa Valley Event, Sonoma Wine Country, the City Club or the Hyatt my clients’ envelopes get mailed around the world. Thank goodness for the post office for carrying all the mail to all the guests. 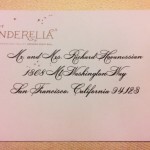 So no matter if a wedding or party is in New York City, Boston, Cape Cod, Beverly Hills, Santa Barbara, Seattle or even Hawaii, just make sure you have the correct postage and guest address. I always advise my clients or party planners to take one sample of the invitation set to the post office to get weighed so that the correct postage stamp is applied. 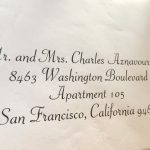 The above Calligraphy for Envelope Addressing is in Black ink on white envelopes. The font style is PE Rounhand. You can also pick a colored ink or a cream envelope. 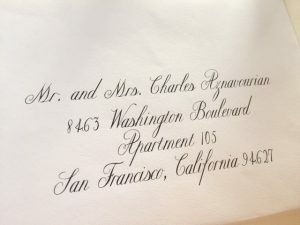 If you have a dark envelope such as navy, black or brown, you may choose to have your invitation envelopes addressed with white ink calligraphy. Please Call Me at (415) 626-0461 in San Francisco, or if you’re not in San Francisco, Toll Free at (866) 626-0461, Email Me at info@hyegraph.com or Stop by Hyegraph 3 Embarcadero Center, SF CA 94111. Please Check out our Happy Customers on our Testimonials Page, more Calligraphy Styles on our Calligraphy Page and our Hyegraph Blog for more addressing samples.